Both tech companies are facing challenges, including slumping stock prices, but one stands out as a better buy. While both Micron Technology (NASDAQ:MU) and Qualcomm (NASDAQ:QCOM) are semiconductor companies, their business models are very different. Micron manufactures DRAM and NAND memory chips, both of which are largely commodity products with prices dictated by supply and demand. Overcapacity at times plagues the industry, leading to major losses for Micron. This happened in 2012, when Micron posted a $1 billion net loss, and it's happening again this year. Qualcomm, on the other hand, derives much of its profit from licensing its patents and technology related to mobile communications. Qualcomm designs chips as well, with the company best known for its Snapdragon line of mobile SoCs, but it relies on third-party foundries instead of handling manufacturing itself. This model has produced exceptional profits for Qualcomm as the smartphone market boomed, but declining chip sales in recent quarters have taken a bite out of the bottom line. Both Micron and Qualcomm are going through difficult periods, and both stocks are down considerably over the past year. Which offers the best risk-reward trade-off for investors? Shares of Micron have tumbled since the beginning of 2015, falling by nearly 70%. After posting record profits in fiscal 2014 and 2015, the slowing PC market helped usher in a period of DRAM oversupply that has decimated Micron's profits. During the company's fiscal second quarter, Micron reported a GAAP net loss of $97 million, or $0.09 per share. That's down from a net gain of $934 million, or $0.78 per share, during the prior-year period. Adding to the company's woes, the smartphone market is now growing far slower than it has in the past. IDC expects global smartphone unit shipments to increase by a single-digit percentage this year, ending a period of explosive growth. DRAM oversupply has started seeping into Micron's mobile business, with the mobile segment posting a $21 million operating loss during the second quarter, down from a $136 million operating profit during the first quarter. It's unclear exactly when the market for DRAM will recover, but these kind of downturns can drag on for quite a while. The good news for investors willing to take the long view is that shares of Micron now trade at a far more reasonable valuation compared to early 2015. The stock sells for less than book value, down from about 3.5 times book value at its peak. The bad news is that things can still get much worse, and the stock still isn't quite as cheap as it was in late 2011 during the last major downturn. The situation may not improve this year, despite fairly optimistic analyst estimates, which could drive the stock price down even further. For investors willing to stomach the volatility, Micron stock looks reasonably priced. But it still needs to fall further to attain bargain status. Qualcomm's licensing business has hit some turbulence, with the company having issues signing licensing deals with Chinese OEMs. During Qualcomm's first quarter, the licensing segment suffered a 12% year-over-year decline in revenue and a 15% decline in pre-tax profit. The company signed various licensing deals with Chinese OEMs in recent months, including Lenovo, Xiaomi, and Huawei, which should take some pressure off the licensing division going forward. Qualcomm is still facing a double whammy of a slowing smartphone market and increased competition. The company's chip segment suffered a 22% year-over-year decline in revenue during the first quarter, with pre-tax profit tumbling 49%, and guidance for the second quarter isn't pretty. Qualcomm expects total chip shipments to decline to a range of 175 million to 195 million, down from 233 million during the prior-year period. One notable loss of business: Intel reportedly will be supplying a significant share of cellular modems in Apple's next-generation iPhone. The problems Qualcomm's facing have driven the stock price down, creating a potential value opportunity for those who believe that things can't get much worse. The stock trades for just 12.5 times analyst estimates for fiscal 2016 non-GAAP earnings, and the dividend currently yields an enticing 4.1%. That dividend looks relatively safe at the moment, but the chip business can certainly continue to deteriorate going forward. Both Micron and Qualcomm trade at depressed levels, but Qualcomm, with its hearty dividend and licensing business responsible for most of the company's profits, wins the day. Micron operates in a very tough industry, and while the downturn in DRAM prices will eventually come to an end, the company's results have room to get a whole lot worse. 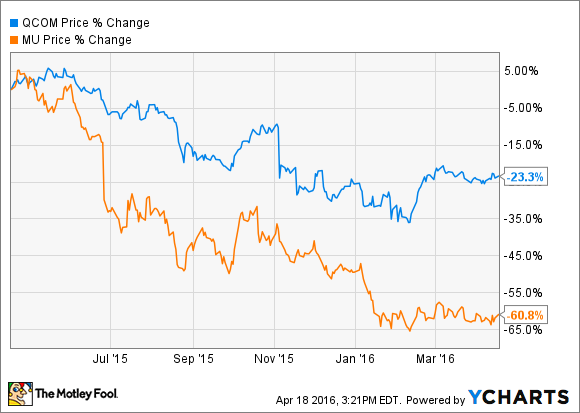 Both stocks come with their fair share of risks, but Qualcomm looks like the better buy.